I grew up a Navy brat, bouncing from coast to coast in the U.S. until the 11th grade, when I hunkered down in the South for more than a decade. Although I had visited family in New England, and my grandmother retained her New Hampshire accent through five decades of living in North Carolina, when I moved north after grad school I was unprepared for the radically unique accent, temperament, and driving style that is Boston. That’s the thing about culture: individuals may have a diversity of traits, but the practices and expectations are shared by the larger group. We may resist it, we may want to change it, but we probably still identify it as the norm. Whether we’re reflecting on driving styles or accents, religious beliefs or parenting practices, in our perceptions of others we often interpret difference in terms of normality. When someone stands too close to us or does the double cheek kiss when we are used to a handshake, we often describe them as invasive, boundary-less, or psychologically impaired. When someone stands politely aside when we expect an affectionate embrace, we feel equally out of place, although we’re more likely to call them aloof, elitist, a cold fish, or, well, psychologically impaired. 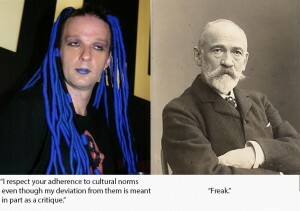 In other words, we see difference as abnormal and weird. Unless people are part of a clear minority or had an incredibly diverse upbringing, they tend to think of culture, or ethnicity, as something other people have. Often this boils down to privilege. Not privilege like “I can afford private boarding school” privilege, but the rather simple ability to not worry about or notice stuff others have shoved in their faces all the time. Minority groups who provide a contrast to the mainstream offer very visible examples of “culture”, with notably different clothes, language, traditions, music, and/or food from the majority. Some individuals even find themselves called upon to represent “their culture” to others, whether it’s having a Jewish kindergartener explain to the rest of the class what Hanukkah is like, or it’s the humorously horrifying example of Oscar Martinez being repeatedly called upon by Michael Scott to represent all of Latino culture in the television show The Office. On the flip side, those in the mainstream often see themselves as being without any ethnicity at all. A white friend of mine in college used to lament that she desperately wished she were “ethnic”. Of course we all have ethnicity, because we all have culture, but it can be hard to feel unique when most people in your world look and act similar to you. It’s why websites and books like Stuff White People Like get so many laughs. It’s unusual and kind of bizarre to talk about whites in the U.S. as having culture. But I’m not picking on white Americans; people everywhere tend to be ethnocentric: they view their home’s peculiarities as right or normal, not as just another cultural lens through which they view the world. This includes well-traveled, worldly people from Austria or Chile or Ghana, small hunter and gatherer tribes from the Kalahari, and even <gasp> anthropologists. Anthropologists strive for cultural relativism, in which we try to understand another culture in its own terms, respecting it as equal to our own. In pursuit of this challenging standard, many anthropologists share a self-deprecating “comeuppance” story, revealing a moment when they realized how enmeshed in their own cultural attitudes they were. Sometimes this is a story of initial culture shock (reference my self-deprecating anecdotes above), but many are about a moment deep into a field project, when the anthropologist feels she has a handle on how the other culture works, and is surprised to find she still has expectations about the universality of her own perspective. A great example of this is the favorite Anthropology 101 article, “Shakespeare in the Bush”. The anthropologist, Laura Bohannon, studied the storytelling skills and traditions of the Tiv farmers of West Africa. When asked to share a story from *her* people (although having studied in England, Bohannon is American), she chose to relate the plot of Shakespeare’s Hamlet in the belief “that human nature is pretty much the same the whole world over; at least the general plot and motivation of the greater tragedies would always be clear—everywhere—although some details of custom might have to be explained and difficulties of translation might produce other slight changes”. In fact, Bohannon found that she and the Tiv elders had widely different interpretations of the events, personalities, and meanings in Hamlet. What proved universal, however, was that both Bohannon and her Tiv hosts were convinced that their own interpretation of Hamlet was not only correct, but would be immediately understood by everyone else as correct. The funny thing is that, for people who settle into a foreign setting and acclimate to its way of life, when they return to their old lives they often report a reverse culture shock, where everything that seemed normal before they left now seems strange and unnerving. This was definitely my experience returning from the “field” – after spending a year at two religious organizations, my return to graduate school left me feeling jarred. Despite my appreciation for the breadth of knowledge and experience at my university, I was suddenly aware of the academic culture I was returning to, and felt bereft at the intellectualism and politics that excluded practices (or often respect) for emotional and spiritual well-being. Anthropologists are unusual in that we seek to understand what is different by living with it until it feels normal and routine. To put it more technically, we like to make the etic (the outsider’s perspective) emic (the insider’s perspective). Often this means struggling through judgments and feelings of discomfort until what seems weird feels normal and, sometimes, what is normal seems suddenly odd. It may seem strange to want to be jarred out of their sense of normality, but there is tremendous value in it. First of all, it helps us bridge the gap between us and people very different than us if all that separates us are the trappings of culture, which can be overcome with time and a little effort. We may not want to adopt a radically different way of life, but perhaps we can better understand how it can feel normal and right to the people living it. And perhaps how our way of life can look really, really strange. It also helps us not take ourselves quite so seriously. If “normal” is relative, then we have a heck of a lot of options for ways of being. We can still deeply value the perspectives and practices with which we were raised, but if something clearly is not working, it’s easier to change if we view the belief or practice as one of several possible cultural manifestations rather than as the one normal option out of a variety of strange choices. For those of us who may not quite fit into the popular norm, this is particularly refreshing! Admittedly, bucking the norm may be problematic or even dangerous, but at minimum, perhaps our sense of self-worth need not be bound up in whether we conform perfectly to our cultural standards. So to sum up: we all have culture. Don’t be we-ahd about it. 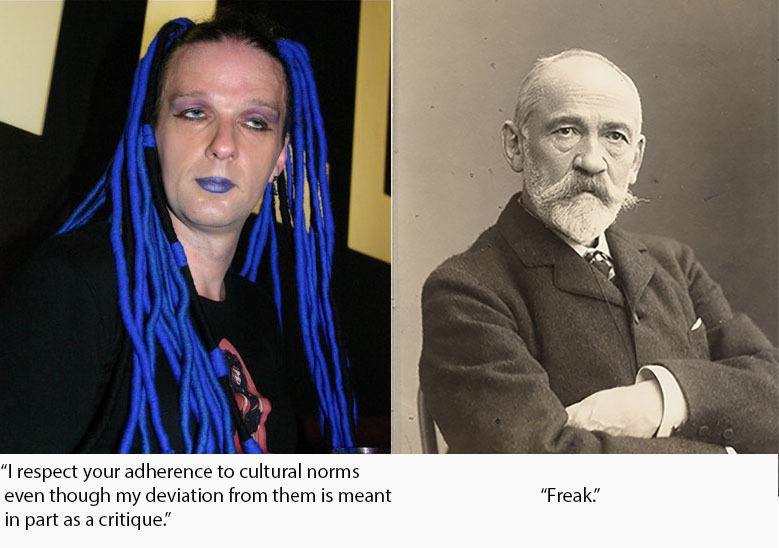 Question: Have you ever had a moment when you suddenly thought of your own culture as “weird”?